This comic book was not produced by a traditional offset printer. Kevin and Peter hand-made copies by copying their work onto legal-sized paper, folding it in half and stapling it together. 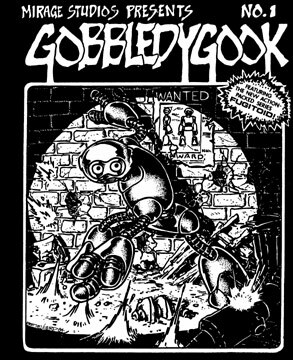 Note that while the original Gobbledygook issues featured the first Fugitoid story (later reprinted as Fugitoid #1), they did not contain any TMNT comics (only a back cover ad for TMNT #1).